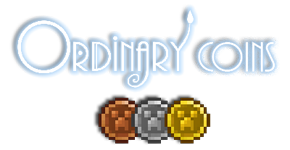 Ordinary Coins - simple mod that adds to minecraft 3 types of coins (e.g. for server economy). You can use it for shops, trade, chests loot, rewards, RPG and adventure maps, etc. Items can be repaired for a 50 silver coins with /coins repair. Hello, I was wanting to know if there’s a way to add either skeletons, withers and dragons to the configs? Hmmm I've seen those coins before in a certain other mod. Is there a way to set the villagers to use coins instead of emeralds? That would be excellent. Hey. I love this mod. It's a must have on my server. I've encountered an issue though. Changing the repair cost in the config doesn't seem to actually work. I only tested this via server, not locally, so I'm not sure if the issue is with that or what, but yeah. I changed the price to 8 coins instead of the default 50, but it's still charging 50 in-game. I am using the 1.7.10 - 1.3.2 version of the mod. Thanks! Edit - So it seems like it's just pretty buggy all-together. While it will charge 50 coins regardless of what you set the price to in the config, you can actually repair things if you have less than 50 coins. However, upon doing this, there is always one coin left over and it's bugged. It won't stack with other coins and if you try, it actually consumes them. I've been using Ordinary Coins along with Vending Block, and they're great together. I was wondering - would you consider adding support for a configurable ratio of bronze:silver:gold, instead of the default 1:100 ratio? I'd like to experiment with a 1:64 ratio, so a full stack is worth the next coin up, and there's no awkward stack remainder when converting down. Thanks for the feedback! 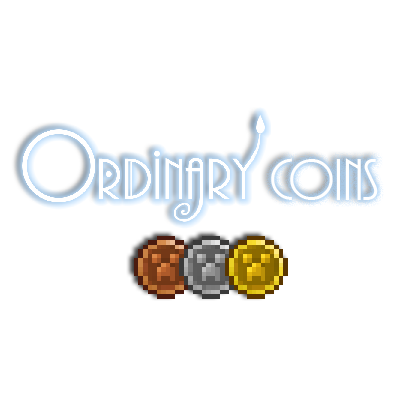 I added stack conversion rate to settings (ordinarycoins.cfg) in latest version. Try to set the value to 64. Can you add like Armor repairing machine or NPC that can repair our armor or weapons with coins? Does anyone make compatible mods that let you use the coins for other things? in the meantime can you add extra commands? Maybe even crafting recipes? maybe you could melt them in your tinkers smeltery? more mod compatibilities would be fun. Looks wonderful, is there a 1.12.2 version available? This is such a great currency mod! I love the simplicity, it fits into a Minecraft world nicely. I do have a question though, is there any way to disable the /stack and /unstack commands? What I hope to do is make players go to a custom npc to convert their currency instead.